My mother-in-laws birthday is coming up soon. My daughter wanted to make her a birthday card. Her favorite color is blue. I found ink smooshing to be a quick way to create a lot of interesting cards. We made nine Thank You cards, three teacher valentine cards, and one birthday card in one afternoon. 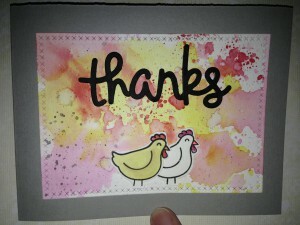 Extra Details: We started by stamping the chick and frame images on some scrap water color paper. I used a grey ink for the frame and black ink for everything else. I used Distress Inks to water color all of the images. Once the ink was dry I fussy cut everything out. I added a flower detail to the chick with some glitter gel pens. Then, I created the card base from some more water color paper. I ink smooshed three shades of blue Distress ink on the front of the card base. 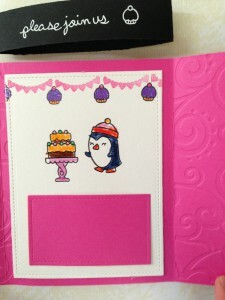 I also flicked some of the extra ink on the card base to create interest. Once that was dry, we attached the images using glue dots. 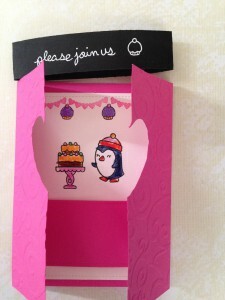 The frame was attached with dimensional glue dots and the chick and accessories used flat glue dots. My mother-in-law and her twin have a birthday coming up soon. My son wanted to make a card for each one of them. This is the card for his great aunt. She has two cars and he wanted to include the cats on her card. Extra Details: We started by making our card base from some heavy weight water color paper. On an extra scrap I stamped the two cats. I used a brown and grey ink to match the colors of the real cats. We stamped a custom sentiment on a strip of black paper using Versa Mark ink and silver embossing powder. 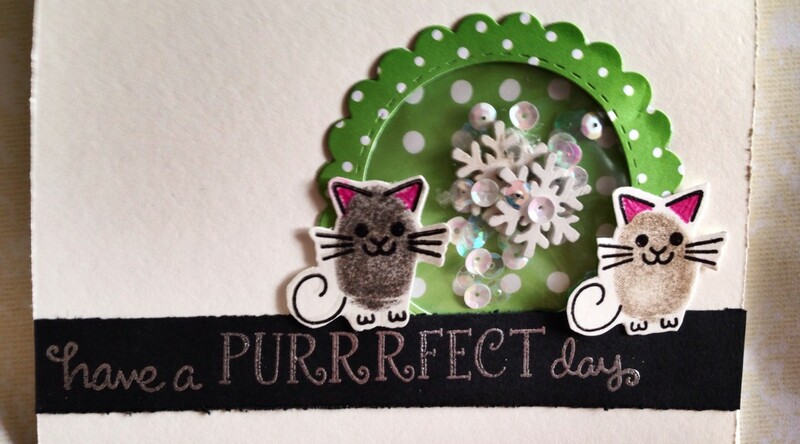 I die cut to scalloped circles from some green patterned paper. I die cut a window in one of the circles. I created the shaker pocket with the Fuse tool and some page protectors. Using strong adhesive, I sandwiched the shaker pocket between the two green circles and adhered it to my card base. 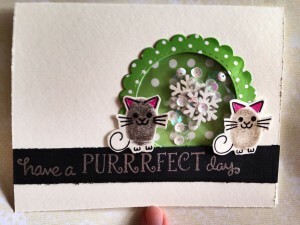 I layered the cats and sentiments over the shaker pocket and the card was done. This is the card for his grandmother. 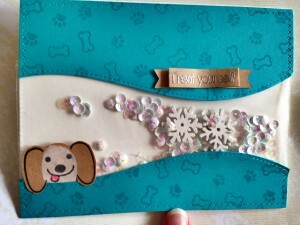 She has a dog and he wanted to include the dog on her card. Extra Details: We started by making our card base from some heavy weight water color paper. Next, I die cut a cross stitched rectangle from some teal card stock. I used some stitched hillside borders to create the open area. 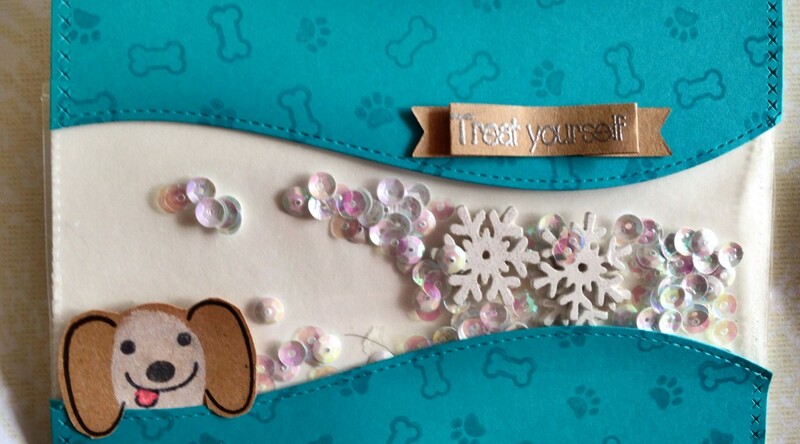 Using Versa Mark ink, I added the bones and paw prints to the teal panels. We used kraft paper to stamp the puppy face and sentiment. I used a white pigment ink for the fingerprint on the puppy face. The sentiment is stamped in Versa Mark ink and silver heat embossed. I then die cut it with a banner die. The puppy face is fussy cut. Then, I worked on the shaker part of this card. I cut two rectangles from some clear page protectors. I used my Fuse tool to seal the two layers together on three sides. I added the sequins and snowflakes, and then sealed the fourth side. Using some strong adhesive, I adhered the shaker panel to the card base. I layered the teal panels on top of the shaker panel. 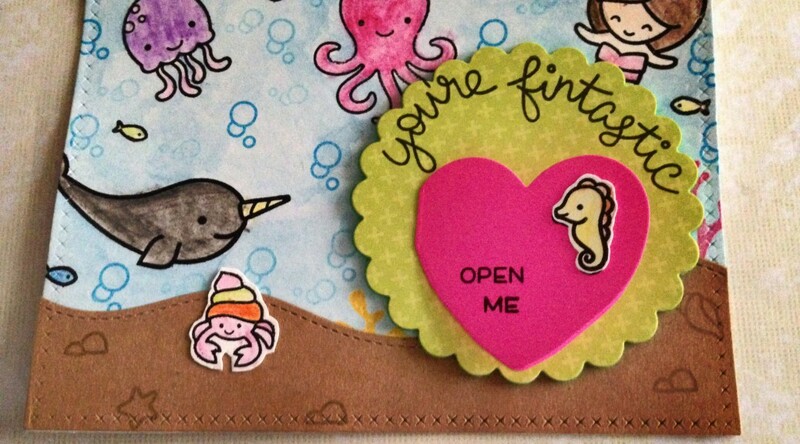 Lastly, I adhered the puppy face and the sentiment banner. 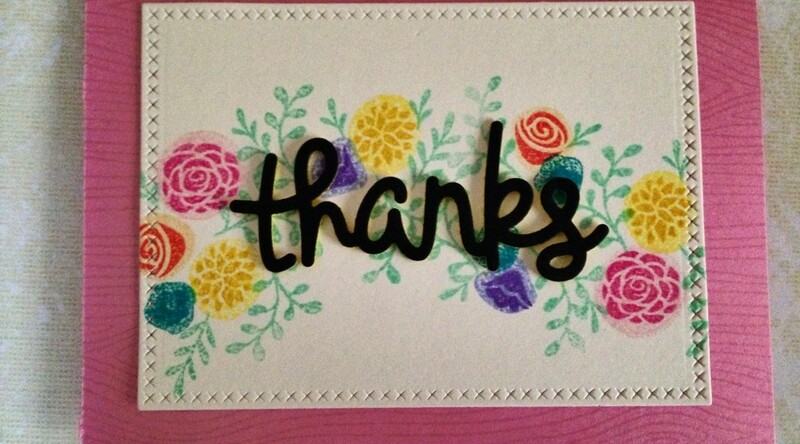 My daughter’s birthday is over and that means THANK YOU CARDS! We spend most of the day creating cards. I, personally, think it was a great day. 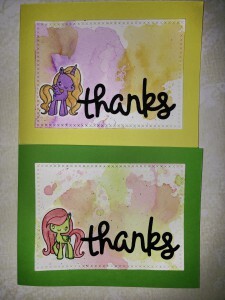 Extra Details: We started by stamping the pony images on some watercolor paper. 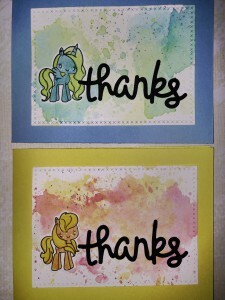 I used Distress Inks to water color all of the ponies. 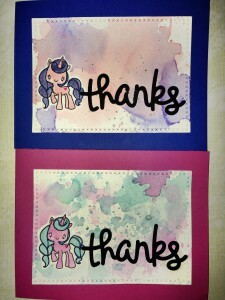 I only used two colors on each pony. Once the ink was dry, I fussy cut them out. We die cut some stitched panels from water color paper. Using the same Distress Inks, I ink smooshed two colors on each panel. I let the first color dry before adding the second color. Once the second color was dry, I added another layer of the first color. Once those colors were dry, I flicked some black ink on to create some very small drops of black ink. These didn’t turn exactly the way I had hoped, but the overall effect is nice. While everything was drying for the last time, I die cut the Scripty Thanks from some black card stock. I adhered the matching pony and one Thanks to each panel. 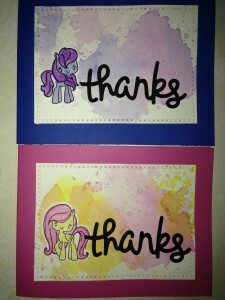 Then I added some details to the ponies with a white gel pen and some colored glitter gel pens. It was such a fun detail to add. Lastly, I made my card bases and attached the water color panels and the cards were done. This is my daughter’s birthday card. She is turning 7 in a few days and loves anything pink and girly. 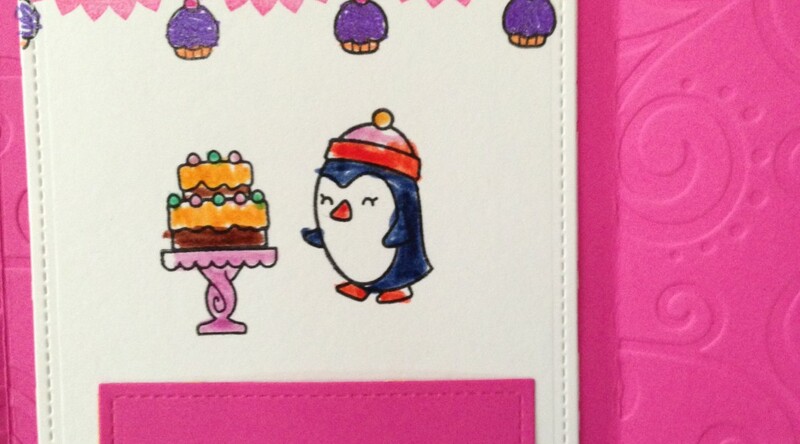 Extra Details: I raided by stash of pre-colored and cut images for this card. I found these fairies all colored in pink dresses and that my daughter would love them. Everything is colored with colored pencils. I built the scene with some other images and die cuts from my stash. I love the small pink die cut strip under the grass. 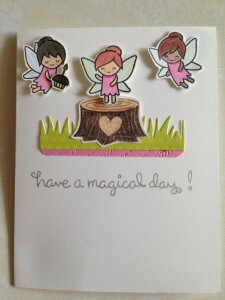 I used dimensional glue dots to adhere the fairies. 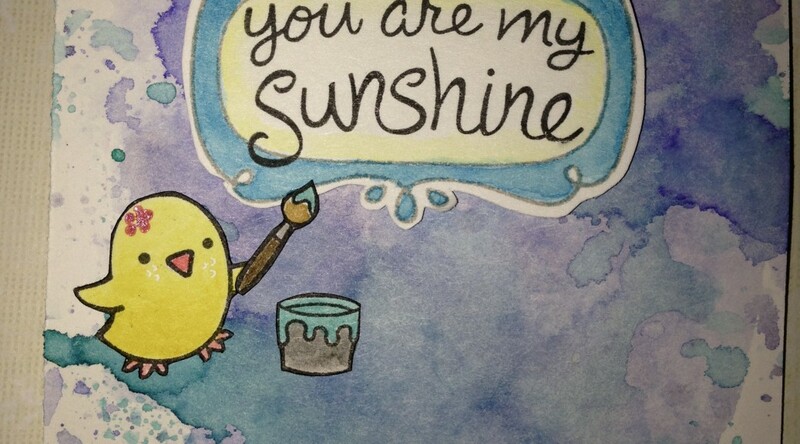 I used a light grey ink and a silver gel pen for the sentiment. My daughter’s birthday is in two days. Today is the day she will celebrate in school. 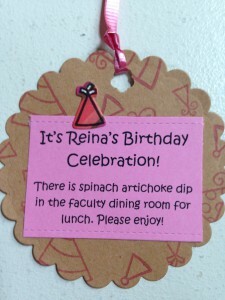 This year, she decided to bring in a treat for the faculty and staff as well as her class mates. She was concerned that if she left the dip and chips in the faculty dining room, that some teachers would miss it. So we made tags for her to hand out to each faculty and staff member. 36 in all! Extra Details: I started by printing the text on some pink card stock using my regular printer. I trimmed out each block of text using my paper trimmer and a stitched rectangle die. Then, we die cut scalloped circles from kraft cardstock. 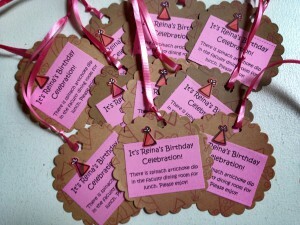 Next, we stamped some birthday hats in pink ink on the kraft paper circles. 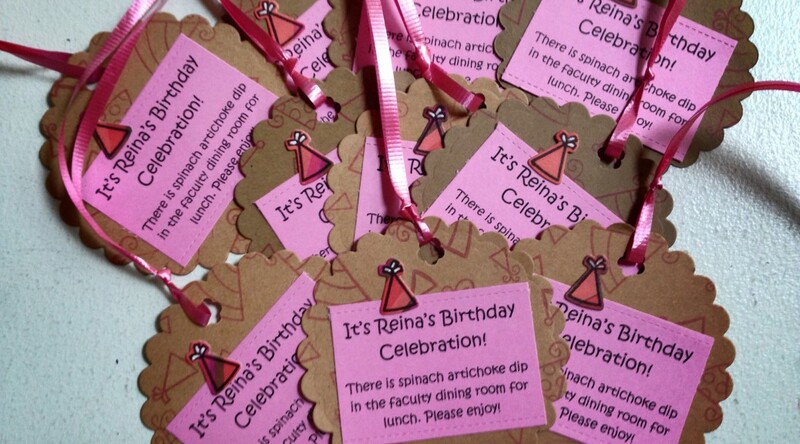 We also stamped some birthday hats on a striped patterned paper. I used the matching die to die cut each of the striped birthday hats. I colored in the top pom-pom bit with a white gel pen to help it stand out a bit. Then, we adhered everything together. We punched a flower shaped hole and added some pink curling ribbon and the tags were done. 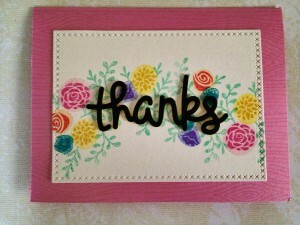 Card sets, fun with paper and ink, LOVE! Lawn Fawn has just completed the sneak peeks of their new spring products. I feel in love with the new flower layering set. 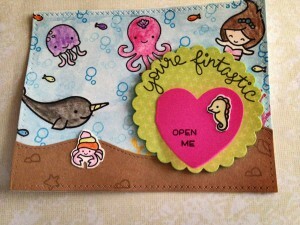 I know it will not be available for at least a month, but I wanted to play with stamp layering. While looking through my stash I found Penelope’s Blossoms set and decided to try to stamp layer those flowers. 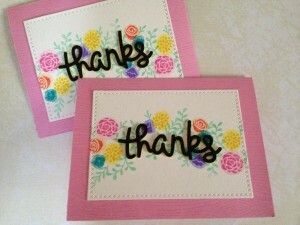 Extra Details: I started these cards by die cutting two cross stitched rectangles from some water color paper. While my CuttleBug was out, I also die cut the Scripty Thanks die from some black card stock and yellow fun foam. The fun foam has an adhesive backing to I attached it to the black card stock before die cutting. Then, I began stamping. I picked some Distress Inks to stamp my flowers in. I made sure to have two shades for each color family. For the lighter layer, I used the back of the stamp to get a solid image. Next, I flipped the stamp over and added the darker layer for the detailed image. Lastly, I added the green foliage to fill in the space. I adhered the Scripty Thanks to the front of the panel with some liquid glue. While that was drying, I worked on my card bases. I decided on a light pink card base. I added some wood grain texture using a very light gray ink. After I attached the stamped panels, the cards were finished. Birthday, Challenges, fun with paper and ink, holiday fun, LOVE! My mother in law needed a birthday card for a close friend. Here is the card I came up with. I LOVE this card. Extra Details: I started with some yellow card stock that I die cut with a large cross stitched rectangle. Then, I used a stitched line border to create rays on my panel. Using some Post It Tape, I masked off every other ray and stamped some stars. 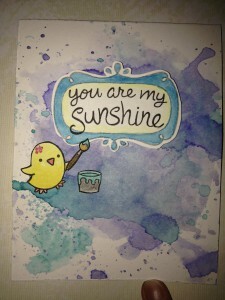 I used three different shades of yellow Distress Inks. Once all the rays were stamped, I added some ink blending to the center point. Next, I die cut a small stitched circle from some water color paper. I ink smooshed some blue Distress Ink on the circle. While that was drying, I looked through my box of pre-colored and cut images. 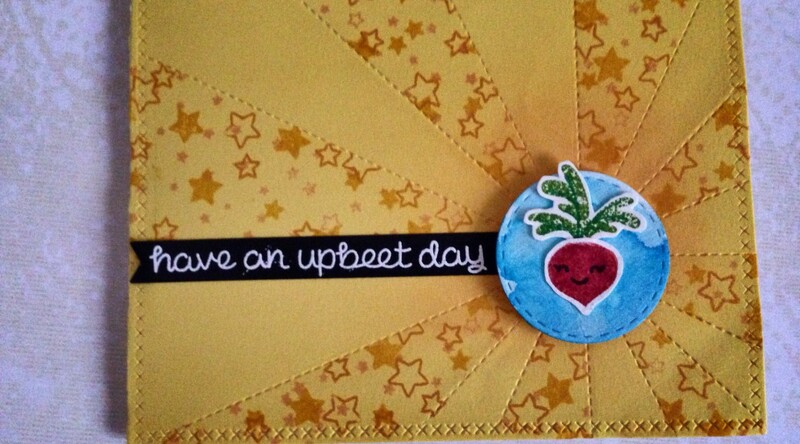 I found this beet image and couldn’t wait to use it. I glued it right on the inked circle. 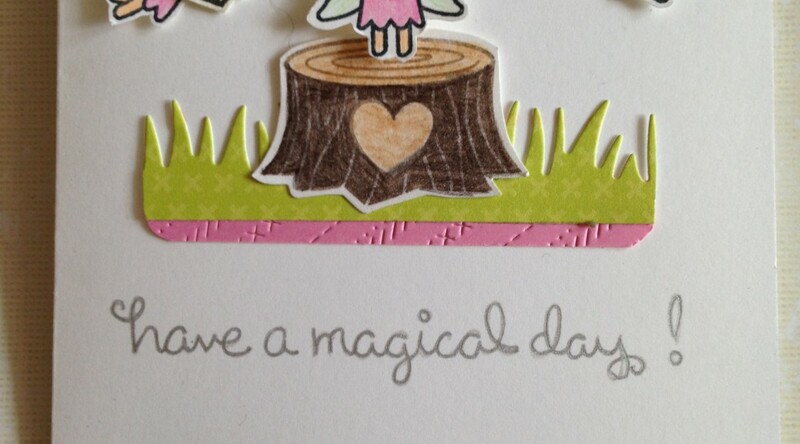 For the sentiment, I die cut a small black banner and used white embossing powder. I adhered the banner flat to the yellow panel and then layered the circle on top with some fun foam. Lastly, I adhered the yellow panel to a card base. 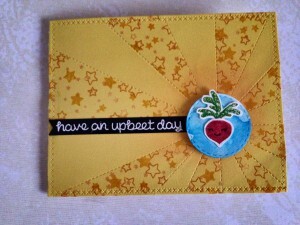 *The beet is stamped in Distress Inks also, but I, sadly, don’t remember which inks I used. Yet again, my daughter was invited to a birthday party that required two cards. Two of her classmates decided to celebrate their birthdays together this year. It was a swimming party, so Reina decided on mermaid themed cards. Also these are only panels; the small hearts are the only thing that opens. Extra Details: I started by die cutting two cross stitched A2 sized rectangles from some water color paper. While the die cut machine was out, I die cut some kraft card stock with the same cross stitched rectangle and a stitched hillside border to create two sea beds for the cards. I also die cut two green scalloped circles and two folded pink hearts. Next up was the stamping. Most of the stamping was done on the large rectangle panels. 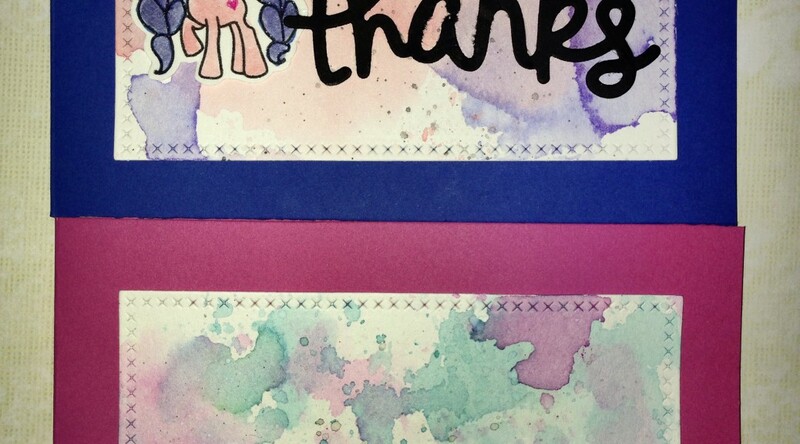 I used Versa Mark ink and clear embossing powder, so we could start coloring faster. I also stamped the sea horse and crab on a scrap of water color paper, so I can fussy cut them out later. 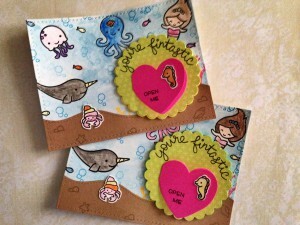 I stamped the sentiments to the green scalloped circles and the pink hearts. My daughter used water color pencils to color everything in. After she was done, I used a water brush to even the coloring out. I also added the blue to the background with a washable children’s blue ink pad. Once everything was dry, we started assembling the “cards.” We started by adhering the kraft sea beds down first. I added some stamping in brown ink to the kraft sea beds for interest. We added a fun foam scalloped circle to the back of each green scalloped circle for dimension. After adhering the scalloped circles, we adhered the pink hearts to the circles. Lastly, we added the sea horse and crab. I felt that the background needed something more, so I added some of the bubbles in the same ink I used to water color the background. I used first and second generation stamping for variety.